I write this letter as I near another personal relocation, this time to Denver, Colorado. It seems I have been everywhere these past several years: East Coast, West Coast, Midwest and somewhere in-between. Is this sleep similar to Mother Teresa, where “dark” night emphasized the intensity of withdrawal of God’s illuminating grace? Was the ‘sleep’ intended to cleanse the soul of every smidge of self-love, thus uniting the person more closely with God? Did Pope Benedict suffer (if such an analogy) his papal career in a darkened night? Personally I have not found any magic God-given GPS that directs a true spiritual path for all. Yes there is God’s word and love of the spirit. But many who walk, whether one calls it a faith-journey, light of faith or life in the faith have experienced times when there is tremendous darkness. For each sojourner, God seems to have etched a different path. Thus, I can understand how easy one can become cynical. For me, one moment of “where’s God” came when several of us attempted to provide one particular small town with some modicum of healthcare. It was a God awful nightmare. Where was this nightmare? Belle Glade, Florida. 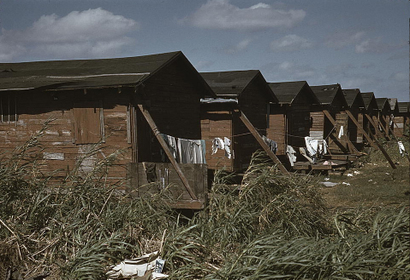 Sixty percent of the residents live under the US poverty level. I actually thought I was in a third-world country. Cheap housing thrown up for seasonal workers became eternal family lean-tos. Clothes drying on balcony rails, leaking sewer pipes filled trash-littered yards, children playing in dirt infested feces, and families cramped in single, cell-like rooms with no running water. Communal toilets are stained and damaged. Outdoor sinks wash babies one minute and pluck a chicken the next. Open dumpsters are laced with flies and stand littered in streets like abandoned vehicles. So what does that have to do with the dark night of soul? It’s simple, when one enters such a town, one searches their soul. Often, you ask, “Where the heck are you God?” The repeated day in, day out flow bears down and one feels lost, alone in the dark. In truth, my best work came from days filled in the “night.” And looking back upon my experience, maybe our best work as a Christian or Buddhist begins when experience matches those who have no hope. Maybe we must experience loss to help the lost, to be forsaken to understand the forsaken, to feel depth of life’s despair to really comfort the abandoned. And by feeling this, we can live and feel abundantly beautiful in Christ. And when I live in the “night,” I live in Christ. Maybe all of us needs a little night every now and then. My next mission is to help 1.2 million obtain healthcare insurance. I’m positive there will be many more ‘dark’ nights. But like Pope Benedict, I’m comforted that I walk not alone. If one believes Ray Lewis is the God fearing man, who’s dutifully trying to amend for the past, then Mr. Lewis is a beautiful example of grace. For those who feel Mr. Lewis bought his way out of a conviction all those years ago, Lewis is your man. Still, if one really reviews the dust of our own cupboard, aren’t we all a little like Mr. Lewis? Doesn’t each of us have some inner demon, some destitute part of the soul that suffers from a lack of redemption? In truth I have been seeking to alleviate my own desperate physical and spiritual poverty. When I look back there were certain choices that, that chosen differently, could have eased a hell of a lot of pain. There’s a difference between a great leader and a great man. I know only too well. I am neither a great man nor great leader. Still, with Lewis’ constant reference to God, one would think Christ appeared to him, just as He di to Paul in Damascus. Still, trust me on one fact, murder does change a man. My hate and anger of so many years ago, replays in my mind. It’s the horror movie that never ends. No amount of works equals redemption. No amount of money will completely ease the pain, the loss, the soul wretched heart-ache. Nothing. Nothing will. Still, being “religious” isn’t essential to being a kind, considerate person, of course. 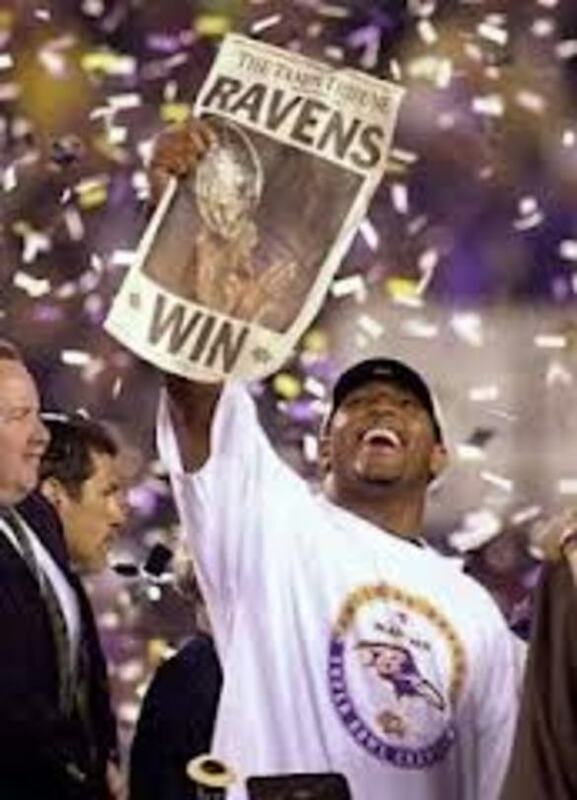 But Ray Lewis emphasizes his Christian value. As Christians, we have been created for great things. Theoretically, as a Christian, Christ should shine through so that all can see Him. Thus far to me, all Mr. Lewis has shown is that he’s a great football player. That certainly is not the definition of a great man. None us need to be more important than we think we are.